Truffles bitter spirits, Caffè Sport, but particularly anisette have become well-known. Dry anise is the symbol of areas such as the Sibillini Mountains. Anise derives its name from the latin Anisum and the Greek Anison, that means "not the same". Mistrà and Anisette arise from the habit to flavour the alcohol drawn from grape residual combined with anise essence. Its alcoholic strenght was and still is intermediate, rich in herbs and health properties. Mistrà a word that comes from Misithra (a Byzantine city), is spread all over the Ascoli and Macerata areas. To appreciate its flavour it's better to drink it undiluted but is also fine when added to expresso coffee or even to coffee powder. 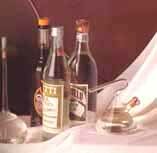 Anisette, a sweeter spirit, is typical of Ascoli Piceno, where it was served at the Caffè Meletti, in the famous Piazza del Popolo. It's fine in the morning but it's delicious in desserts. A refreshing drink when diluted with water, Anisette is even a pleasant digestive. Some people love it with a "fly" (threee or four coffee beans inside the glass). Two types of wine, preserved through particular as well as natural methods, come from the inland agrarian areas: Vin Cotto and Vin Santo. Vin Cotto, in the south, is the results of boiling grape juices. It's a longer lasting, sweeter and stronger product. Never missing in the farmers'cellars, this wine was drunk in special occasions, especially during important meals given for emperors, kings and popes. In the north, Vin Santo is a dessert wine, rich in sugar and flavour. It derives from the withering of grapes, through a slow fermentation process and a very slow ageing time. I goes also with pastries and cakes but also with cheese. The so called Vino di Visciola (sour cherry wine) is available between Jesi and Pesaro. It's aromatic and derives from squeezing this fruit, similar to black cherries, which grows on the hills and the mountains of this region. This is a perfect dessert wine and is served with traditional country cakes.